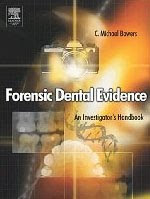 "The book, which has a particularly attractive format and lay-out, offers the reader a detailed and updated overview of the modern methods employed in forensic odontology. The author, who is both a dentist and a legal professional, offers a number of concrete examples of investigations, where forensic medicine played a determining role. Case presentations, while focusing on identification, bite mark analyses, abuse and mass disasters emphasize, the role of methodology, the paramount importance of team work, on-site investigations, thorough searches for evidence, etc."